Your Havenese is like a son or daughter to you. Let’s think about it from a parent’s point of view. There are only two things that you are concerned with about your children. Are they healthy and are they happy? That’s the same for our Havanese. I will leave the health part for another blog post. Today, let me try to answer your question in mind: Is my Havanese happy? Although Havanese cannot speak and tell us how they actually feel, you can kind of tell whether they are happy or not by simply observing. On the other hand, you can also make sure that you are doing things that you are supposed to do to keep them happy. Let’s explore this subject in detail now. How do you know whether your boyfriend or girlfriend is happy? It’s simple. There are two ways. First, To look at their eyes and feel their current emotion. Second, to talk to him or her and see if the response is cheerful. Since you can’t really talk to your Havanese, let’s stick to the first point, which is to read your Havanese’s eyes. It is very nice that Havanese have eyes that are so big and so easy to read. You can simply tell whether they are sad or happy from their eyes. If you need more guidance, the simple rule of thumb is that when their eyes look like puppy eyes (watery and cute), they are happy. Besides the eyes, when you see your Havanese’s body is relaxed, he or she is probably having a good time. That’s pretty similar to human too. When we are not happy, we are probably nervous, sad or stressed. It’s easy to see ourselves have tighten shoulders and unrelaxed hands when we are under that unhappy state of emotion. Some wise man said that one of the best ways to solve a problem is to invert the problem. In this case, to know that your Havanese is not unhappy is a good way to know that your Havanese is very likely happy. How to tell if your Havanese is unhappy? If you Havanese is messing up your home like crazy, there is a good sign that he is being unhappy. Very likely, he is looking for your attention. May be it’s a good time to stop whatever you are doing and spend some time with your Havanese. Another way to tell your Havanese is not happy or even not healthy is to see if he can finish his usual meal. It he can’t, and if he can’t do that for consecutive meals, there is a good chance that your Havanese is either sick or unhappy. Both are not good signs and in this case it is safer to take your Havanese to a vet. 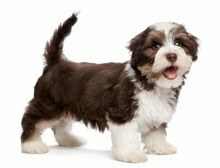 If your Havanese is running around and looking cheerful during playtime, there is no doubt that he is being very happy. On the other hand, if you throw him the ball and he doesn’t get you the ball the way he usually does, there is probably some issues going on. For us, we probably have to super happy to jump and hop. That’s the same thing for your Havanese. If your Havanese hops, there is a sign that he has achieve the highest level of happiness. That usually happens when he sees some nice and new food and he has never seen before. The mix of curiosity and excitement usually can give your Havanese the biggest happiness. Just like we human love good surprises. When we feel relaxed, we love to lie on the sofa. When Havanese chills, they lie on the floor with belly up. It is a lot of fun to watch your Havanese chilling in that super relaxed and human like posture. One simple way to make your Havanese happy is to give them exercise. To do that, you should have a at-least 30 minute walk with your Havanese every single day. With you can have a 2-hour hiking session with your Havanese at least biweekly if you can’t really do it weekly. You will be surprised by how much your Havanese like hiking. You will also be surprised by how much happier all these walking and hiking can make you. I always support home cooking for your Havanese. Some people may think that it’s a lot of trouble and instead only give them commercial foods. The reality is that one meal usually takes 15 minutes of preparation which isn’t too much to ask, considering that you are the parent of your Havanese. Try to cook them some simple food like the boiled chicken leg. It is both tasty and convenient. The simplest way to make your Havanese is to simply spend more time with him. It is very simple but it’s not easy for many people. When your Havanese is longer as new and exciting as he first seems, it’s understandable that you may have a tendency to spend less time with him yet it’s not tolerable. Owning a Havanese is a long term commitment that we have to stick to for around 15 years. It’s our responsibility to spend time with them and make them happy.